It must be noted that this post is not endorsed, approved nor solicited by the makers of ANDREA Air Purifiers. I just think it's a really cool device. But in terms of function, I don't think this one really works well. In theory it would seem so but in actual use, I have read reports that it doesn't. But that being said, I want to clarify that I still like the concept and the look of it and would not hesitate to get one given the opportunity. House plants, aside from bringing aesthetic beauty to a home also has beneficial use. They also purify and renew stale indoor air by converting carbon dioxide to oxygen as well as trap pollutants from the surroundings. Plants can be considered as nature’s air filtration system for the earth. 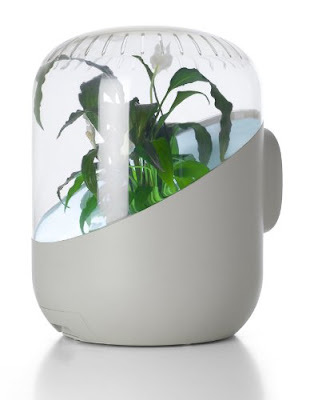 In 2007, as part of an art and science experiment, French designer Mathieu Lehanneur with Harvard professor David Edwards invented the ANDREA: Plant-based Air Purifier. ANDREA is an air purifier designed to maximize and enhance a plant's natural absorptive property in absorbing toxic gases, such as formaldehyde and other pollutants in the home and office environment. For more than 30 years, scientists have been researching into how to improve a plant's capability to naturally clean the air of harmful pollutants. The ANDREA Air Purifier advances on these efforts by constructing a device to house the plant that will aid in continuously drawing polluted air from the environment and passing it across living surfaces that absorb and metabolize gaseous pollutants. The biochemical transformation of waste, through the plant’s natural metabolic activity, eliminates the pollution beyond simply collecting it on filter surfaces. ANDREA employs both active plant filtration, along with water and soil to provide a multistage system that cleanses air from harmful toxins that can irritate and be harmful to your lungs. It naturally purifies air by drawing it with a fan to propel it through the leaves and root system of a plant, then out through water and soil filtration and back into the room environment. There are reports though that the fan starts to get loud after a year of operation and issues of molds and mildew (which may be due to the choice of plants?) hasn't been addressed. Consumer Reports, an impartial organization that rates devices state that the ANDREA Air Purifier "... won't help remove dust, pollen, or smoke". Nevertheless, it does look like a real cool device and I won't hesitate having it in my home (if i could afford it).